Maruti Suzuki has started testing the 2018 Maruti Ertiga (2018 Suzuki Ertiga) on public roads. Using details made out from spy shots, IAB’s automotive illustrator Shoeb Kalania has created an early rendering of the 2018 Maruti Ertiga. Spy shots suggest that the 2018 Maruti Ertiga will have a longer body than the current model's (4,296 mm). 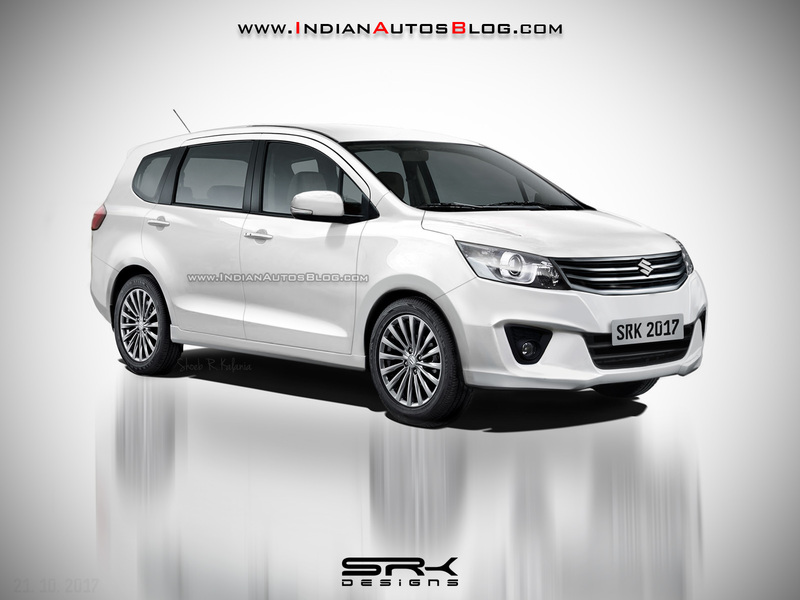 The speculative rendering of the 2018 Maruti Ertiga shows a completely new front-end with rectangular headlamps, redesigned radiator grille with two horizontal slats and more aggressive bumper and reshaped lower grille and fog lamp housing. On the sides, the next-gen Maruti Ertiga in the rendering has a reshaped quarter glass and new alloy wheels. Spy shots have revealed that the all-new model will have a more raked back glass. The second-gen Maruti Ertiga (codename: Maruti YHA) will have a longer body than the current model's (4,296 mm). The redesigned Ertiga should utilise the Heartect platform for its basis. The new platform should bring weight savings and improved stiffness. The current model is available with 1.4-litre petrol and 1.3-litre diesel engine options. Maruti Suzuki may swap the latter for its new in-house developed 1.5-litre diesel engine, either at launch or later during the lifecycle. It’s unknown what the company plans for the petrol engine - upgrade it or replace it. The second generation Maruti Ertiga will likely move to the Heartect platform. The 2018 Maruti Ertiga will reportedly reach the market in August next year. The Suzuki-badged version will arrive first, in Indonesia, in the first half of 2018.